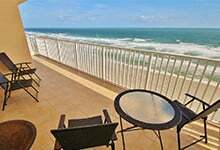 July 25, 2015 – “Absolutely fabulous” is how you describe this vacation condo with a perfect beach view in New Smyrna Beach , FL! This is a 5 star condo! We have stayed at numerous vacation rentals from FL to CO and not one comes close in comparison to this wonderful retreat. The 2 bedrooms and the living room open right onto the patio to the perfect view of the beach. What a way to wake up everyday! 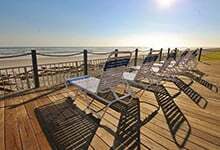 The owners have thought of everything you would ever need, to have a relaxing, comfortable and fun day at the beach. We have never rented a condo that comes with a cooler, beach towels, chairs, an umbrella, toys for big and little kids and a wagon so we could haul it all together. The beds are heavenly, and the rooms are so spacious that none of us or our belongings were on top of each other. You can make make full meals if you prefer to stay in a night or two. Again, the owners have thought of everything for the kitchen too. There are all kinds of pots and pans, cooking utensils and great dishes. They have a variety of games and movies as well. Also, with their complete laundry facilities in the condo, there is no need to over pack. If you enjoy shopping and restaurants, Flagler Avenue is where to go. You can find anything from fun beach decor to the perfect t-shirt. The Italian restaurant, That’s Amore, was spectacular. We eat Italian everywhere we go, and it’s going to be hard to have to wait to return. All 7 of us had something different, and we all loved what we ate. Norwoods Tree House is a fun atmosphere serving good food and wine. If you want good pizza, go to Panheads. Breakers, which sits right on the beach, is a great place for lunch, Again, we all had something different and liked everything. We sat at the window bar that looks straight out onto the beach – fun! It was the most relaxing week of vacation we’ve ever had with our kids.